An icy numbness envelopes. Am I lost? Where am I? And my loved ones?? Am I going to be alone from now??? Alas! Who can do this to Dads and Moms? For one day tables will turn. Of a similar act. Ah! History repeats. I go back to my Victoria College days. MA English Literature classes. The second year had Modern Poetry paper and the poems to study included the Second Coming and Sailing to Byzantium by W B Yeats; The Wreck of the Deutschland and the Windhover by Gerard Manley Hopkins; and Ash Wednesday, The Love Song of Alfred J Prufrock and The Waste Land by T S Eliot. We had some of the finest Professors teaching us and Modern Poetry was taught to us by Dr. P. Achuthan. A teacher par excellence, he is said to have done his Phd investigating the influences of the Bhagavad Gita on T S Eliot in The Waste Land. I still remember that it was in January of that year that we were to being The Waste Land sessions. However, the overly rights conscious people (many times for the wrong things!) that we Keralites are, there was an indefinite college teachers’ strike that was going on at that time. The strike began and we also got the news that Dr Achuthan was going to another college on transfer. Ten of us – nine of us girls and the lone boy – were so upset that we may not have Dr Achuthan teaching us the poem that he loved the most – The Waste Land and wrote his doctoral thesis about. It was then that Dr Achuthan asked us to go to his home. In the drawing room of his house we made ourselves comfortable. We were very clearly told that he will need two full days to do justice to the 433 lines of the modern verse characterised by ‘disjointed narration, fragmented identities, and splintered religious faiths’. Today, looking back I admire the passion and enthusiasm of this phenomenal teacher. He did not want to ruffle feathers by teaching us at college while others were on strike. So to camouflage it perfectly, we were invited home for those precious classes. We would listen to him in rapt attention, take a break for lunch and then reassemble for the post lunch session. Two days of 10 – 4 pm classes and we were through. I guess he was able to passionately instill in us his infectious liking for The Waste Land. By March I had memorized the 433 lines of poetry – not because I was expected to do so – but for the sheer love of the poem and it multifarious insights. 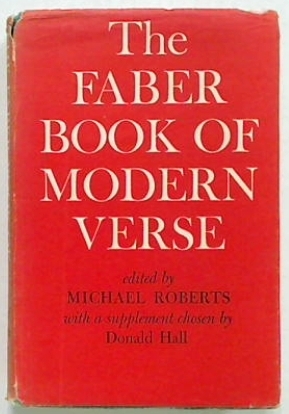 I also remember that his interpretations of the poem were minutely written in my orange coloured poetry book – The Faber Book of Modern Verse. And my greatest regret is that I lost this prized possession at a crucial point in time, amid the battle of life. It seems that Eliot was on the verge of a nervous breakdown and was under the care of Dr. Roger Vittoz in his sanitarium at Lausanne, Switzerland where he wrote most of the lines of the poem. May be that accounts for the disjointed narratives, the tell tale signs of his broken will. Just as he delved into the caverns of his own mind to find decay and deformities within, The Waste Land meanders through the innards of the cadaver of the present day society (true even now!) – waist deep and sinking in sickness, perversion and corruption of every kind. The three ‘Da’s that Prajapathi utters to his disciples: “to give,” “to sympathize.” (i.e. have compassion) and “to control” (here, self control). Eliot seems to say that the claps of the “Da’ thunders if followed will be rewarded by spiritually rejuvenating rain, literally and figuratively. Thus even while civilization is crumbling -– “London bridge is falling down falling down falling down” –- the poem ends with a peace mantra: “Shantih shantih shantih”, meaning Peace. Peace. Peace. Invoking Peace. Peace that passeth all understanding. How uplifting! And, yes, today is T S Eliot’s 125th birthday! It was written in 1922 and was dedicated to Ezra Pound.